I’m going to admit to setting crazy high expectations for The Indigo Spell, and then being a little disappointed it didn’t hit that mark. Yes, there’s that bold four-star rating just a few lines up. This book is definitely worthy of those stars. No question. It’s well written and the character arcs progress in ways that I think are smart. Here’s the thing, though, I’m a bit of a Richelle Mead fangirl. I love her novels because they take big emotional risks. That’s the trademark of her third books. In each series the third novel is the one that gives great hope, then takes it away and then teases better things to come. Shadow Kiss from her Vampire Academy series has a jaw-dropping twist. Succubus Dreams from her Georgina Kincaid series made me want to throw the book because my emotions were so tangled in the plot. I may have contemplated ways to climb inside a novel just to beat up Kiyo after reading Iron Crowned, the third book in the Dark Swan series. As such, I went into The Indigo Spell expecting a good, solid angry cry. Awful things had to happen, right? Only they didn’t. I devoured this book. It was a delightful read. The banter between Syndey and Adrian sparks and is incredibly engaging. This book gave us all the things we wanted as readers including some Adrian/Sydney kisses and subsequent Sydney freak-outs. It was fun. It progressed the series, but there wasn’t the kind of obstacle in their path that I’ve come to expect from Mead. Maybe she’s changing her M.O. The ending of The Indigo Spell—no, I won’t spoil it—is a game-changer. Perhaps book four, The Fiery Heart, will bring the emotional one-two punch we’ve come to expect in book three. Regardless, I continue to love her well-crafted characters and snappy dialogue. 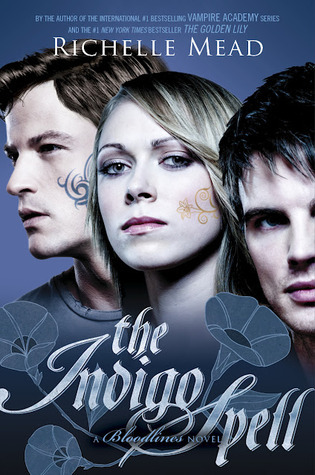 And, really, despite my confusion over not crying while reading The Indigo Spell, I can’t wait for the next book. I’ll adjust my expectations, though, so I can glom all over it properly. I kind of liked that there wasn’t an emotional bang yet. I think Sydney’s emotional character arc rings prezty true or realistic with regards to her history. Loved the twist in the end. Ooh, this sounds like a bit of foreplay…you’re expecting the Big One and get just a heavy pet. NEXT TIME, right? Love Richelle Mead & her characters. I felt the exact same way when I was reading this. I built this book up so much and it didn’t quite meet how I built it up, but it was still a good read. For me, I felt like this book was the culmination of everything Sydney has been going through since her character was introduced in the Vampire Academy series. She had to make a lot of decisions based on her changing feelings toward certain things in her life, and I think with the Fiery Heart we will see the consequences of some of her decisions. @Angela and Amy M – EXACTLY. I think Fiery Heart is going to have all the angst (and at least one angry cry) I was expecting with Indigo Spell. Also, I predict a whole lot of dream sharing. Mmm. Oh, I think the twist at the end made it clear things weren’t going to be easy in the next book. I expect it to get good and complicated. I’ve only read Vampire Academy and Bloodlines so far, but otherwise, I really agreed with your review. Actually, my review was kind of similar. I thought it was a good book, but just not what I expected from a third book. But maybe you’re right. Maybe she knows what we expect from her in third books and decided to change it up? Like you said, I liked the book, but I think my expectations were too high for it.